Canon Allan Budzin was born in South Bend, Indiana. After elementary school, he began studies for the Roman Catholic priesthood at Carmelite Junior Seminary in Hamilton, MA. He graduated from Marquette University in Milwaukee, WI with a degree in philosophy. After teaching high school in Los Angeles, he was ordained a priest in 1980 at Niagara Falls, Ontario. His first parochial assignment took place at St. Gertrude’s Church in Stockton, CA. He came to Toronto in 1983 for graduate studies at the Toronto School of Theology. During that time he also assisted at several Catholic parishes in the west end of Toronto. After leaving the Catholic priesthood, Al married and taught at George Brown College for several years. In 1997 he became an Anglican priest and returned to full-time parochial ministry. 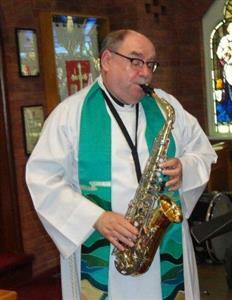 He is currently parish priest at St. Philip’s Anglican Church in Etobicoke. His interests include poetry, jazz, and thoroughbred horse racing.